For anyone wondering about the People’s Palace and the effects of any changes made since the closure at the start of the year – worry not. I got there sooner than I expected to, and took advantage of the chance to get there shortly before closing yesterday. It’s all still there (there are some unrelated changes and other fixes underway, but they don’t count), plus a new display in the temporary exhibition space upstairs. Obviously, there’s no access to the Winter Garden/glasshouse. Corridors and doors that used to lead the public that way are no more. New routes have been established for the lift and toilets, with the latter now directly accessed from the main entrance foyer. Sadly, the large arched window that formerly provided a view into the glasshouse has been painted over, so is now just a plain white feature. The café that used to be in the glasshouse is now located in the space to the left of the doorway into the shop, where the counter can now be found. This extends into the room/space at that side of the shop, which holds a display relating to Templeton’s carpet factory building which can be seen through that room’s window. Unfortunately, they managed to close the doors to that room just before I got my camera out. The display was around the perimeter of the room anyway, so no changes really needed to be made to allow tables for the café to be added to the space. The temporary exhibition space on the top floor was created some time ago, and has already been home to a number of short exhibitions. The space used to be dedicated to many of Glasgow’s industries, but sadly, for some reason best known to whoever sanctioned the change, all those artefacts were dispersed after the space was cleared and used for registration for the Monte Carlo Rally when it started from Glasgow some years ago. 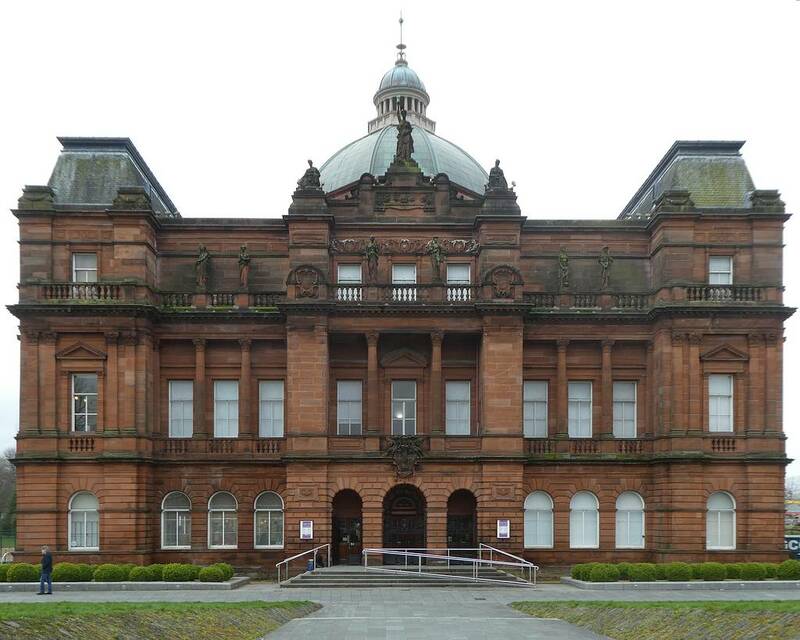 Currently, it now holds a number of black & white prints from a collection of old pics taken by members of Glasgow’s camera clubs, and is well worth seeing. The other notable change is the loss of the balcony that used to overlook the Winter Garden from the top floor of the People’s Palace, as this has been walled off. I had been worried about access to the Viewing Gallery (or just Viewpoint) overlooking Glasgow Green and beyond, but am pleased to say that as this is part of the stairwell, when I pushed the door it didn’t set of an alarm, but still led to the gallery. Today, the view showed the fair that was at the base of Nelson’s column was packing up and leaving. One of the problems I spotted arising from closing off direct access to the glasshouse was the unfortunate side effect of also blocking access to the new bike racks provided there, as they were installed immediately adjacent to the north door, so fall within the fenced off zone. Fortunately, there is a second set of proper bike racks provided adjacent to the disabled parking area, located just to the left of the main entrance into the building. Those paying attention may have noticed I missed something. While I didn’t forget about spying out revisions to the emergency exits (a problem, as this was previously provided via the glasshouse doors), I did forget to pay attention to the detail, and note them. I did notice the new corridors etc had the usual signs and arrows, after which I completely forgot I had meant to look at where they went. While I couldn’t make the trip to see for myself today, I was pleased to see that the media didn’t forget to give the reopening of the People’s Palace a mention. One of Glasgow’s most popular museums, the People’s Palace, is reopening after being closed due to concerns over the neighbouring glasshouse. It was forced to shut in December because of structural issues at the Winter Gardens – which was used as the fire escape from the museum. The People’s Palace opened again after £350,000 of modifications were carried out. The alterations included a new fire escape, café and retail space. The museum – which highlights the social and cultural history of Glasgow – also has a new photography exhibition capturing daily life in the city in 1955. Originally shown in the People’s Palace, one of my favourite painting now hangs in Kelvingrove, alongside a number of other paintings showing ‘old’ Glasgow. If I’m right (and I forgot to check the plaque) the painting showing the strike on 05 August 1810 is by Glasgow artist, John Knox. In those days, lighting conductors were still to be invented and fitted to tall structures, so lightning damage was not unusual during violent storms, as happened on that day. It seems the top 20 feet (6.1 metres) of the column collapsed, with serious damage caused to the remainder. The stone exterior covers a rubble filled interior (said to be from demolished building). Troops were brought in to keep the crowds away until repairs were completed. A careful look can reveal signs of that damage today. I think that hint means the different stone used to repair the damage, as against actual visible damage – there are distinct areas of stonework at the top, which have different colour/weathering. The repair is not really much younger than its surroundings, but perhaps the stone used for the repair did not absorb the black soot staining from Glasgow’s industrial era as readily as the original material. Erected in 1806, it rises to a height of 144 feet (43.89 metres), was designed by architect David Hamilton (1768-1843), and paid for by public subscription – 80,000 attended the laying of the foundation stone, such was the popularity of Nelson at the time. It has a grim past too. Glasgow had a cheery little saying, to “die facing the monument” referred to public executions, hangings, which took place in the square to its east from 1814 to 1865. Nelson’s monument would be the last thing the condemned saw as they faced east from the scaffold, before they dropped. Excuse the reflection, there’s not much choice about where to stand to catch this view. The lighting is also very warm, and I’ve cooled this down a little. The actual strike is hard to see as this painting is mounted quite high on the wall, so I tool a closer look, and there is much more detail than suggested at first glance. I cooled this down a little further, as it looked even redder in isolation, and increased the contrast, a little. The request/suggestion for Billy Connolly to consider doing a farewell gig at Barrowland reminded me I had collected another pic of the little reproduction neon sign exhibited in the People’s Palace. The first time I notice this one, and tried grabbing a pic, I thought the blue ‘neon’ stars had failed and were all dead. My guess back then had been that some of the phosphors were maybe being exited by the adjacent tubes, but I realised later that this was wrong. In fact, a closer look showed that a few were still lit, albeit fairly dim. I recently tried for a better pic, with a little enhancement to pick them out a little better than in the first shot. I think I did better this time, and you can see the ‘live’ stars amongst those that have expired. Looks like it’s down to only three. This was probably made at a Glasgow neon workshop (oops, sorry, I forget the name of that workshop) that I believe is now closed, since neon has largely been superseded by cheaper alternatives, and was a bit of a craft and art, was also becoming expensive, and a bit risky (in the eyes of some) due to the high voltages employed.